Dragon Hotel01686 668359work HotelThe Dragon Hotel is an historic 17th century, former Coaching Inn with 20 en-suite bedrooms, many with exposed ancient timbers, cosy restaurant, indoor swimming pool and much more. All guest rooms have en suite facilities, TV, tea/coffee making facilities & the hotel facilities include a refurbished indoor swimming pool, free WiFi and car park. The restaurant and bar are open daily for lunch and dinner. Food is served from 12:00 pm - 14:30 pm and 18:00 pm - 21:00 pm. The Dragon Hotel is an historic 17th century, former Coaching Inn with 20 en-suite bedrooms, many with exposed ancient timbers, cosy restaurant, indoor swimming pool and much more. The hotel is in the centre of Montgomery which hosts a small market in the Town Hall every Thursday selling fresh fruit & veg, fishmongers, cakes & crafts. 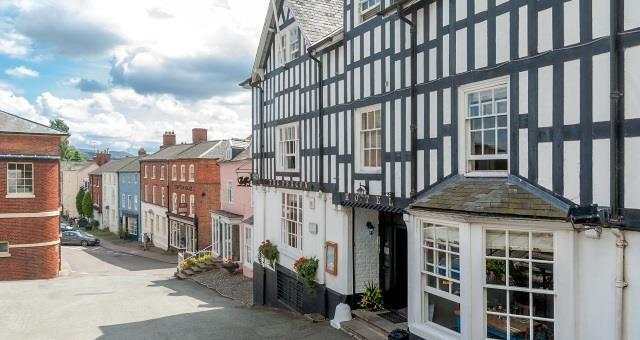 This historic market town is set in rolling landscape of the Mid Wales Welsh Marches (borders of Powys and Shropshire), only 1.5 hours or so travel from the West Midlands, Liverpool or Manchester. The Dragon Hotel is located at the top of the town square behind the town hall and there is a free car park located at the rear of the hotel.